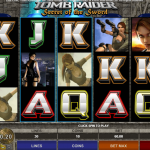 Tomb Raider II, or the secret of the Sword is the second title that Microgaming has released based on a very popular video game. A young girl, Laura Croft, can do everything that Indiana Jones did in the very popular movies. 3 different special symbols are here just for you, to help you win lucrative awards, the wild symbol, bonus symbol and a scatter symbol. The wild has the same function like in most of the other Microgaming games, to substitute for all the other symbols except the special symbols. What caught our attention is the Super Mode feature that activates randomly. You get 5 free spins and that is not all, during the feature the wild symbols remain in place and can drastically increase your wins. The free spins feature is powered with the Rolling Reels. 3, 4 or 5 Excalibur Key symbols will award you with 10 free spins and every time you land a winning combination the symbols disappear and are replaced with new ones. The multiplier can increase up to x5 after every consecutive win. The Global Adventure Bonus feature will allow you to see Lara Croft in action looking for the fragments in various ways. Go through the locations and try to avoid the booby trap and play the Shootout Bonus Feature for some good wins. Tomb Rider II might look a bit outdated compared to other Microgaming games but it still has lots to offer. It is a great mixture of bonus features, special symbols and a nice exciting game play. Liked this one? 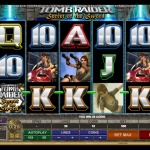 How about trying the first episode of Tomb Raider a 5 reel slot by MicroGaming.